What is a belief eraser? “The PSTEC Belief Eraser” is a tool which YOU can use on ALL the negative and limiting beliefs YOU want rid of..
Use this ONLY on those on the beliefs you want rid of! Weaken them or eliminate them. These are very special audio tracks which are completely flexible and YOU control their use. You can use the Belief Erasers on literally ANY negative belief you have that you wish you didn’t have. Step 1: Decide which unwanted negative beliefs and programming you will use it on first. Step 2: Start the track and follow the instructions. As you follow instructions, the track will go to work on your subconscious mind in order to remove as much of the belief as possible. Simple! In PSTEC Negative Tim has created another quite profound tool which can make big and necessary changes to a person’s mind model to allow them to function in a much happier and free way in the world. In essence it is a way to weaken a belief to such an extent that the original idea often seems a little ridiculous afterwards. I have seen several clients very recently for whom this technique has been quite life changing. As well as emotions, it is very easy to inadvertently pick up disempowering beliefs as we go through life and even if we are aware of these, it often isn’t possible to just “drop” an idea or change it through conscious will alone. PSTEC Negative does for belief removal what the standard click tracks did for emotions. Every self helper and therapist should have this in your toolkit. For self helpers this can save you a lot of time and sometimes remove the need to apply PSTEC Positive statements in certain situations. In other situations it can make your PSTEC Positive statements much quicker, more effective and long lasting. For therapists in particular, amongst other things, the correct use of PSTEC Negative can quickly bypass clients who are subconsciously resisting help (for example the “yes, but” people). I am grateful; that the creator of PSTEC knows how to create the things he does. However it works it surely works! For decades I’ve been affected by one of those beliefs that I did not realize was a belief and not a fact and I needed to rid myself of it. This particular belief was not a big deal but after so many years I could definitely see its cumulative impact on my health and well being. PSTEC Negative has made a tremendous difference in my attitudes and behaviors around health and well being. This old belief that I had held so closely, that was such an obvious fact as to remain unquestioned for years and years, has now been seen through as the misperception it always was. It no longer drives my thinking or my interpretation of experience and so has gone away. I now feel much more free to choose my actions and expectations around healthy behaviors without all that old resistance. Thank you PSTEC! I used the new PSTec track for removing negative beliefs on an issue that has been around awhile, but that I only recently became consciously aware of. The belief itself is not important to know, but the results of working on it are. As with the other click tracks I have used, my mind can hardly even come up with the issue/belief once I have treated it. I felt so much lighter and expansive. There is no longer fear around the old negative belief. My heart feels more open to giving and receiving love. PSTec tools change the way we see things, change our perspective. That’s what a miracle is, a change in the way we see something. A miracle is simply NOT seeing what ISN’T there. As Tim states in the background of these tracks, the issue, fear, memory or belief was never the truth. It never had any substance. Once our mind grasps that truth, anything can happen. Our perspectives change and our lives change. I was very impressed with how quickly and thoroughly this new track works to remove false negative beliefs. It was much easier to then use the Positive click tracks to suggest my new desired belief. This was time well spent. I have been laughing as I used the [Belief Erase] on a belief I never actually knew I had. [Knew I had the problem] and today had absolutely proof of efficacy. It is about my walking and a hip issue which I have suspected is not just physical. Did the [PSTEC Negative] track and the PP [PSTEC Positive track] last night and today happened to be hiking, quite a long one with ups and downs and my body behaved as if it was still 50 instead of 70. Clear Negative And Limiting Beliefs – Fast! If you can imagine the consequences of clearing out all your limiting, unwanted and negative beliefs then you’ll understand what this tool is for. In fact you’ve probably got ideas already about exactly which beliefs have caused you the most bother. You probably also know already which beliefs you will want to use the eraser on first,. Here are some suggestions to get you started. Use this for self help or therapy. Use this on beliefs which have caused you emotional problems. Use this on beliefs which have kept you stuck. Use this on unwanted early programming from childhood. Use this on unwanted religious programming. Use this on negative beliefs which were drummed into you. Use this on your limiting beliefs. Use this to combat negative self talk. Use this for better relationships. Use this for self development. Use this for sports achievement. Use this for academic achievement. Use this for self empowerment and progression. Use this for success in sales and business. There are lots more things you can use this on too of course. Unwanted Childhood Programming? Negative Self Talk? Whatever the causes of your limiting or dis-empowering beliefs, you know they exist. And when you think about them you also know what damage they cause. Many limiting and unwanted beliefs are caused by childhood programming. Negative beliefs are also very often made worse by poor self talk. Perceived failures may not have helped you either. Unwanted beliefs can also be caused by peers, poor teachers, dysfunctional marriages, difficult experiences, dis-empowering religious experiences, chronic mistakes in parenting etc… You’re probably more than familiar with the origins of your negative and limiting beliefs. Now finally, whatever the causes of unwanted beliefs this new PSTEC tool is designed to help you to undo the damage. 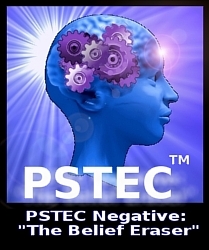 Finally you can access “PSTEC Negative: The Belief Eraser”. It is designed to help you with all of those things quickly and effectively. It works on your subconscious to let you feel the difference consciously. As with all tools of this nature, people experience its results in different ways but the purpose is the same. Direct it at your negative beliefs. Pick the biggest or most troubling ones first, or alternbatively begin with little ones and work your way up. The choice is yours. It’s simple really. You decide what belief or past programming needs to be dealt with first. Then you use the PSTEC Negative Belief Eraser on it. You’ll get full instructions and the process is easy to follow. A single play of the track is designed to significantly weaken any unwanted belief or alternatively to remove it altogether. You’re going to be very surprised how easy this is to use. It’s quick too.